Founded in 1895, Prestatyn Cricket Club in North Wales has had a dramatic history, and over the last 20 years Dennis mowers have helped restore the club’s pitch to a standard named the best in the Bridging Finance Solutions Liverpool & District Cricket Competition in 2011. In 1990, the area was hit by the Towyn floods which forced more than 2000 people to be evacuated from their homes when the sea defences failed. As part of the clean-up, waste water including sewage and other debris was pumped onto the local-authority owned pitch from the surrounding properties, killing the grass. Part of the process was to replace the old mower with a Dennis FT510, which has an industry-leading cassette system allowing the same machine to be used for cutting and a range of key maintenance operations. 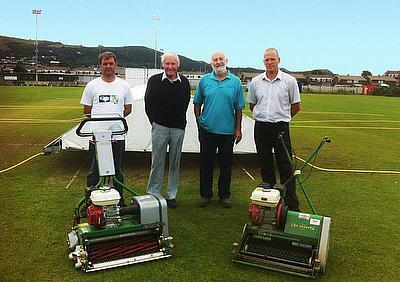 Prestatyn Cricket Club specified a nine blade cylinder, a scarifier, a verticut reel and brush for the FT510, which has a working width of 510mm (20in) for a high level of productivity. The FT510 was replaced on a like-for-like basis in 2004, and Tony comments that both mowers proved extremely durable and reliable despite a high workload. “There are 13 strips on the senior square and we also like juniors to play on turf rather than artificial strips, so one mower was cutting two squares and preparing the wickets,” he explains. The superbly balanced mower gives a particularly fine finish with its 11-blade cylinder, and features a tungsten tipped groomer and Weile roller. It is powered by a Honda Q9 engine for quiet, low vibration operation. The club has a strong community feel and the committee is keen to encourage junior participation in an area where little cricket is played by youngsters, visiting schools and offering juniors top quality playing conditions. Tony maintains a good relationship with local dealer Major Owen, and comments that Dennis was also very helpful when he was setting up and getting to know the mowers.